The first and only Chinese head of state to use a Western name publicly, Wellington Koo was born in Shanghai on January 29, 1888. And with a silver spoon in his mouth; the son of a merchant father (who named his son after the Duke of Wellington), he grew up in a mansion in the International Settlement, and was educated at one of the prestigious St. John’s College school. Yet, while life may have been privileged, it was not without injustices for a young Chinese boy. Koo got a taste of foreign discrimination when, at the age of nine, a British policeman fined him for riding his bicycle on the sidewalk, while an English boy in front of him went unpunished. It was an oft-cited experience that he never forgot; Koo spent his life attempting to dismantle the causes of the superior-inferior relations between foreign powers and China, and was instrumental in negotiating the end of the ‘unequal treaties’. After completing his PhD in international law and Diplomacy from Columbia University, Koo returned to China in 1912 to serve the new Republic of China as English Secretary to President Yuan Shikai. 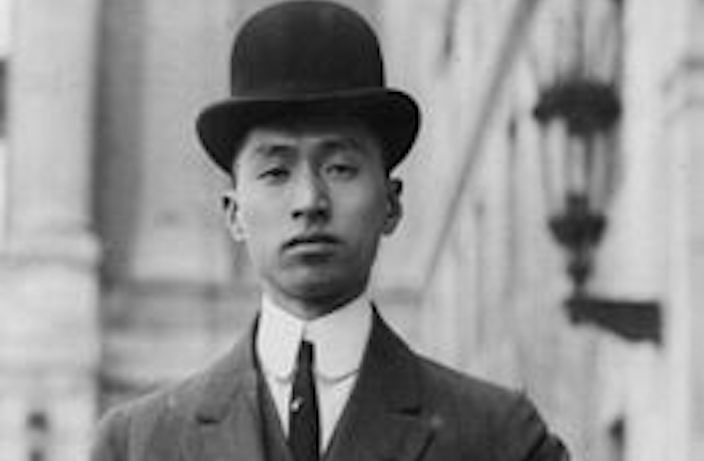 In 1915, and at a precocious 28 years of age, he became ambassador to the United States, the youngest ranking diplomat ever to go to the US. In 1919 Koo was a member of the Chinese delegation to the Paris Peace Conference following the end of World War I. There, before the Western powers, Koo demanded that Japan return Shandong to China, and called for an end to unjust imperialist institutions in China. Despite American support, the Western powers refused his claims. This rebuff, and the transferring of German concessions to Japan, sparked widespread student protests in China, in what came to be known as the May Fourth Movement. Reflecting the sentiment of their nation, the Chinese delegation were the only nation that did not sign the Treaty of Versailles. Koo was briefly Acting Premier, Interim President and Foreign Minister during a period of chaos in Beijing under Chang Tso-lin in 1926-1927, as well as being China’s first representative at the newly formed League of Nations and the country's signatory of the UN charter. He also served as ambassador to France and Great Britain. A dapper gent, his prodigious relations were not restricted to the diplomatic. He married five times: including to the Pao-yu “May” Tang, daughter of former Chinese prime minister Tang Shaoyi; to Hui-lan Oei, one of the 42 acknowledged children of sugar magnate Oei Tiong Ham; and to a Mongolian Princess, Betty Char-nuis Borjit Yen – cousin and bitter rival of Hui-lan – who later became a noted fashion designer in Hong Kong. Limited to the island of Taiwan after the Kuomintang lost its grip on power, Koo retired from the diplomatic service in 1956, going on to become a judge at the International Court of Justice at the Hague. He rose to vice-president before his retirement, aged 80, in 1967. He settled in New York, where he died in 1985. For more, This Day in History stories, click here.